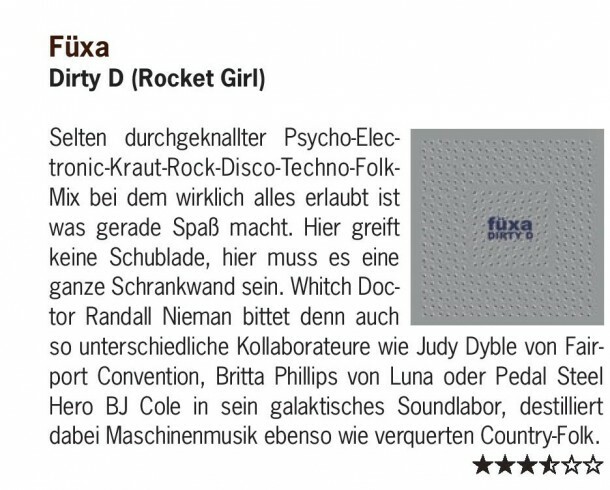 Comprising a sixteen-strong army of collaborators, Füxa’s tenth full-length album, Dirty D, is at once a sonic celebration of creativity, and a rapturous denunciation of some of the demons of modern society. Following on swiftly from 2012’s Electric Sound of Summer (itself released after a ten year hiatus), Dirty D is a characteristically euphoric record – a largely electronic set which shifts from solarised hysteria (‘Sun is Shining’) to crepuscular elegance (‘Razzamatazz’) over the course of its dozen tracks. The dirty ‘D’ of the title could refer to a number of disquieting facets of today’s society – the dominance of Disney, the illusion of democracy, dereliction – and, in contrast to Disney’s sickly saccharine supremacy over our children’s imaginations, Randall Nieman and his collaborators offer us an animated aural narrative which, in its playfulness and gracefulness, allows for multiple readings on the anxious social issues of our days. 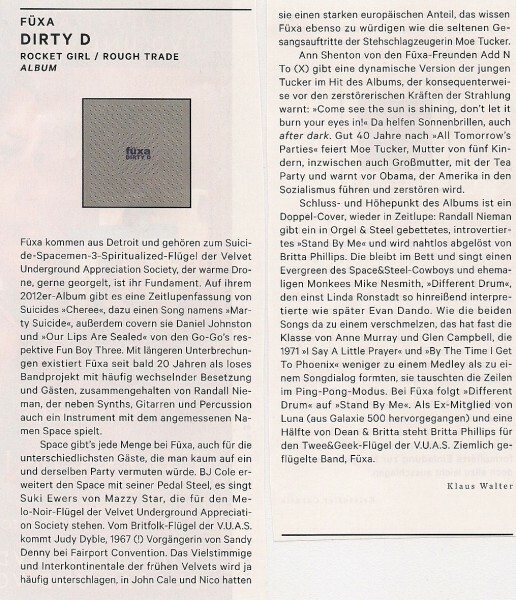 Dirty D’s cast of characters (which includes pedal steel hero BJ Cole, Ann Shenton of Add N to (X), and Britta Phillip’s of Luna/Dean & Britta) have been cherry-picked by Nieman to ensure a diversity that never feels disjointed: a genuine sonic democracy. While Electric Sound of Summer pivoted around a number of cover versions, Dirty D comprises mostly original tracks. The opener, ‘The Blue Barracuda’, (written by Kersbergen / Dyble) sees Nieman join circuit boards with Suki Ewers of Mazzy Star, Gaute Storsve of Ignore, and Oliver Kersbergen of Sleepyard who also produced the track conjuring a delicate, aquatic backdrop to accommodate Judy Dyble’s vocals. The track acts almost as an aural departure lounge before the soaring lift-off of ‘Reverse’ which, with its sister track ‘Forward’, combines Nieman’s synths and BJ Cole’s lap steel guitar to produce a pair of astonishing Country & Galactic ‘space waltzes’. 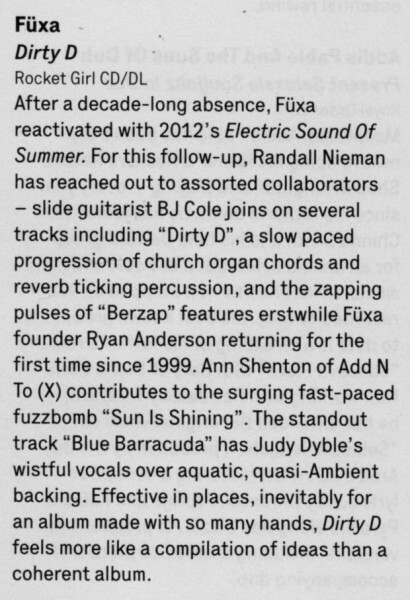 BJ Cole’s playing features on another pair of tracks (‘Berzap’ and ‘Dirty D’) and, while he and Judy Dyble are new to the Füxa fraternity, a number of past partnerships have been rekindled across the album. The aforementioned ‘Berzap’ features founding member Ryan Anderson on a new Füxa song for the first time since 1999’s In Flight Audio, while the first single taken from Dirty D, ‘Sun is Shining’, sees Nieman lock synthesisers with Ann Shenton of Add N to (X) thirteen years after they first collaborated on the Add N to Fü(X)a EP. Its seemingly simple refrain – ‘Come see the sun is shining, don’t let it burn your eyes in’ – could relate to astronauts’ reliance on technology to protect their sight from cosmic radiation in flight, or a lesser-evolved native tribe mistaking a nuclear blast for a second sun. The song suggests certain technological advances could potentially bring about humans’ undoing – and is itself an example of technology being pushed deliriously to its limits. Dirty D’s cover versions – ‘Whisper’ and ‘Stand By Me/Dd’ – showcase the extremes of Nieman’s musical influences, as well as his innovative transformative techniques in the studio. ‘Whisper’ is a cover of an obscure, overlooked Jeremy S Gluck song (and features Füxa’s newest member, Stefan Persson, on vocals), while the closing track, ‘Stand By Me/Dd’ sees Nieman take up vocals on a fragile retelling of Ben E King’s classic, which segues into Britta Phillip’s (Luna/Dean & Britta) poignant rendering of Linda Ronstadt’s ‘Different Drum’, with Kyle Chunco on guitar. The juxtaposition of ‘Stand By Me’s love-saturated, masculine defiance with ‘Dd’s love-resistant, feminine defiance creates a tender tension between the two vocalists: a symbol perhaps of today’s uncertain social and economic push-and-pull. The two love songs, ‘Stand By Me’ and ‘Shout Out Loud’, are Nieman’s first appearances as lead vocalist put to tape, and it seems appropriate to hear his voice on arguably his most assured, ambitious and personal record to date. Ultimately Dirty D is Fantasia for the disenfranchised: a space-and-time-capsule of sounds and ideas that deserves to be heard by every eardrum beneath and beyond the troposphere.